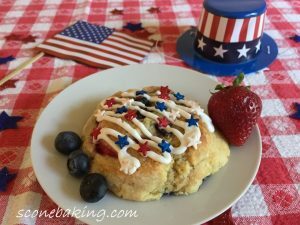 Red, White and Blueberry Scones are the perfect way to start your 4th of July celebration. Here is the photo tutorial showing you step-by-step how easy they are to make. 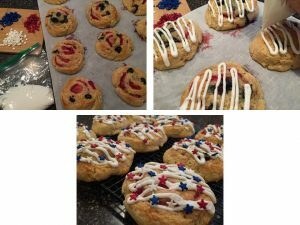 Not only do they look great, they’re delicious too. 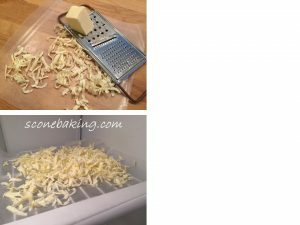 Preheat oven to 400 degree F. Grate butter and put in freezer. 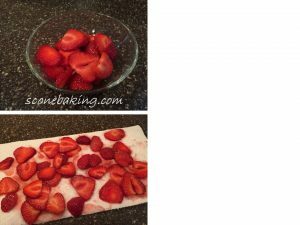 Slice strawberries, blot dry on a paper towel; set aside. Mix in frozen butter. 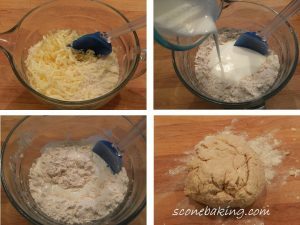 Add buttermilk and mix until just together (do not overmix, the dough is very loose). 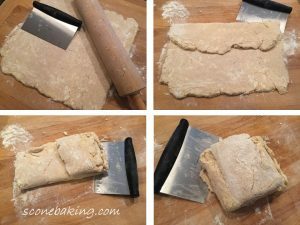 Place dough on a heavy floured board and pat into a square. Roll out into a 12″ square. Fold into thirds, and then fold into thirds the other direction (you should have a square again). 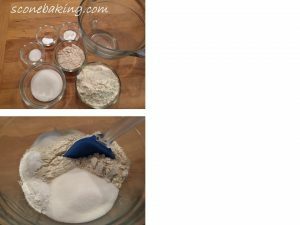 Put on a floured plate; put into the freezer uncovered for 5 minutes. 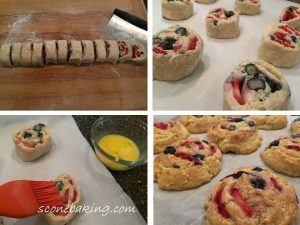 Place sliced strawberries and blueberries in the freezer for 5 minutes. 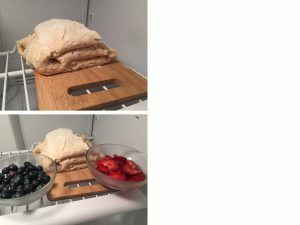 Remove dough from the freezer, roll dough into 12″ square. 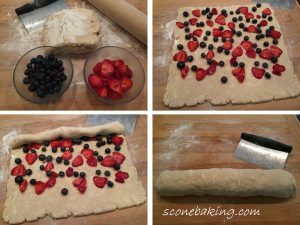 Scatter strawberry slices and blueberries on dough. Roll dough like a cinnamon roll, into a tight log. Cut log into 12 one-inch pieces. 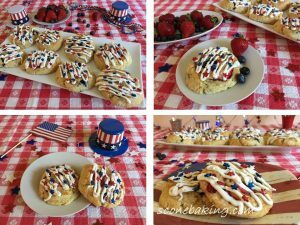 Place on a baking sheet. Brush tops with beaten egg. Bake at 400 degrees F. for 16-20 minutes (until golden brown and delicious). Cool on cooling rack. 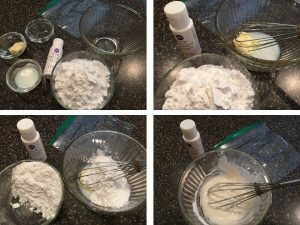 Once scones are cooled, whisk together icing ingredients: softened butter, milk, vanilla and powdered sugar, until smooth. 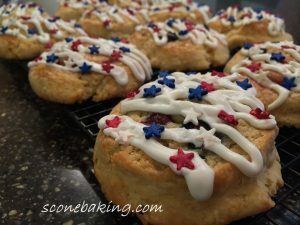 Put icing into a ziplock bag, cut a 1/4-inch hole in the corner and drizzle on scones. 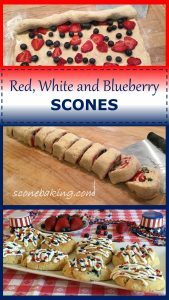 Add optional red, white and blue stars sprinkles.